As a High School team, the only elements of Synthetic Biology we studied before starting iGEM were the basics of protein synthesis as part of our Biology Course. So, in order to prepare for the work ahead of us we had to spend a few weeks of intensive studying and learning the basics of the molecular techniques we were going to use. 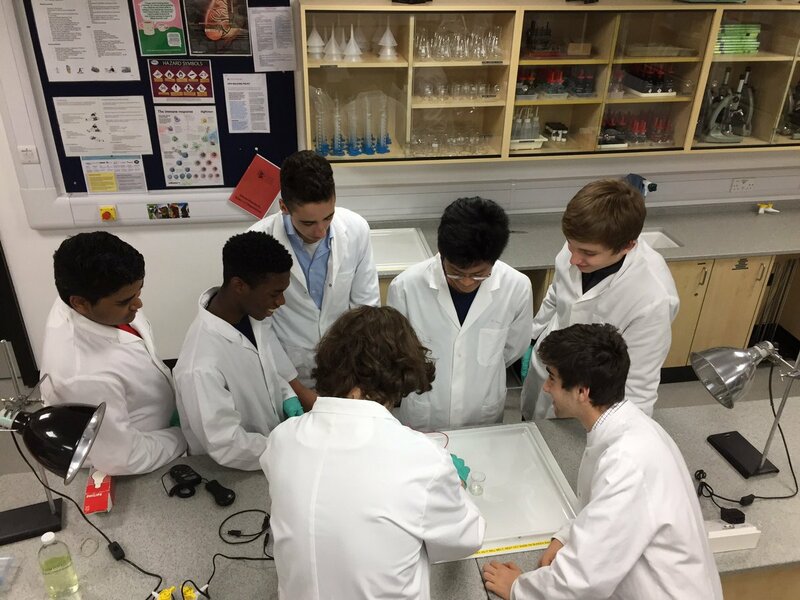 One of our aims this year has been to set up a model that would allow the future teams from our school to take part in iGEM without needing significant help from any other institution, which is why we aimed to work as independently as possible using our own labs. As a result of this we spent the first month brainstorming ideas and learning the theory behind what we were about to do. Our PI taught us the basic techniques involved and discussed cloning strategies with us. Our initial lab work consisted of learning the techniques that we were going to apply to our project. Sara White, Senior Biology Technician at our school taught us necessary microbiological techniques and the ways of working in sterile environment - everything from autoclaving media and waste to different plating techniques. She contributed greatly to the success of the project. Our PI taught us molecular biology techniques - anything from using Gilson pipettes to making and running the gels and programming PCR thermocycler. We discussed all aspects of our project with out PI. Methods specific to working with Synechocystis PCC6803 were discussed with Paulina Bartasun and John Rowland of Imperial College, who also gave us the E. coli glycerol stock from which we miniprepped the pDF-lac plasmid to use in our transformations. Imperial iGEM team checked through our cloning strategies and advised us early on to try and go standard assembly rather than 3A assembly. We did all the fundraising on our own, although we are extremely grateful to Mrs S. Fletcher, the Head of our school for helping fund our project when we fell short of our target. All the work we carried out in our school lab. In order to do this we needed to notify the Health and Safety Executive of the Contained Use of Premises for GMO work, for which we needed expert consultants. We are thankful to Kirsten Jensen and Karen Polizzi of the Imperial College for reading through our risk assessments and safety policy and acting as the points of contact for HSE. We are also grateful to the Senior Management Team of our school for allowing us to do some lab work over the summer while the refurbishment of the building was taking place. At times, working with the construction crew around us was interesting, not the least when the fire alarm was set of in the middle of our minipreps. Our main references for all the techniques were the instructions from the kits suppliers and OpenWetWare.org. When facing a problem in our work we turned to OpenWetWare and users' comments on there and tried to solve everything by trying out different things. This was best exemplified when we spent three weeks working out why our minipreps weren't working. When everything else failed, we turned to Imperial College Team for their help and advice. In this particular instance they tested our samples and worked out that our gel stain was not sensitive enough and pointed us in the direction of the one they were using. We discussed all our cloning strategies with our PI and he advised us on the changes we needed to make. Much of our work was informed from Anthony, C. et al. Our PI also taught us all the experimental techniques we used and safety procedures. This was solely the domain of our Student Leader, Clemens, who did most of the work and guided us through the rest. Thanks to Elias for his amazing charcoal drawings, which Clemens then digitised and implemented on to the wiki. Clemens even managed to get Mr Zivanic (our PI) to do lots of copying and pasting of code throughout different parts of our Wiki. He reliably informs us that his favourite task was italicising Latin names. We are grateful to Imperial College for allowing us to practice our presentation with them. We are also grateful to Tom Kelly from our school for helping us print our poster. James was completely responsible for researching human practices aspects of the projects. We are thankful for the members of the public who were willing to talk to us during our open event and who agreed to pose for some photos with us, as well as the younger pupils who helped to test our board game. We also give our thanks to the City of London School Citizen Team for editing our articles for their newspaper. Our sincere thanks go to the Biology Department at our school who sustained our hectic working schedules. As most of our work had to be done from September onwards due to summer works in the building, we had to fit all the lab work around our free time during school day, which meant random access to labs and the prep room.